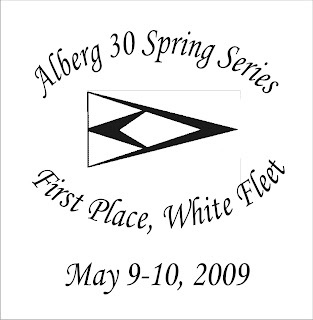 The first White Fleet award will be presented at the Alberg 30 Spring Series this coming weekend. I just wanted to give you all a preview of the art work for the award. The award will be a pint glass engraved with the following design. The prize will be contested according to the rules laid out previously in e-mail and on the previous blog post. If you are interested in competing for the White Fleet award, you need to inform me by Midnight on Friday, 5/8. Looks nice! Great to see this award being put out there. I'm hoping we'll see some enthusiasm from the fleet to get involved with this.